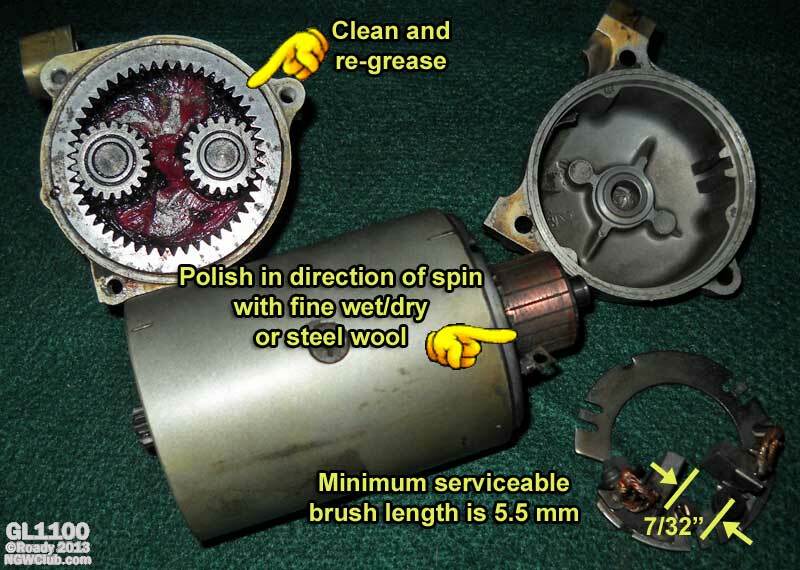 Replace starter brushes GL1200 and others - NGWClub®, Inc. 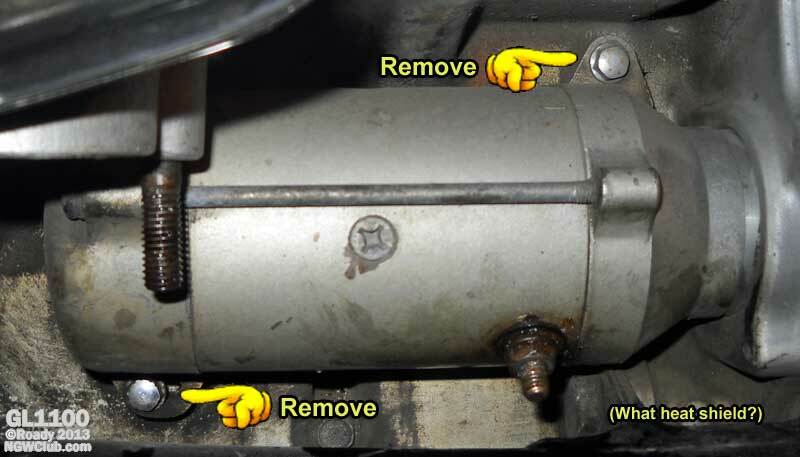 This was written specifically for a GL1200 but other than the removal it works with every Honda motorcycle starter I've ever seen. I have rebuilt 2 GL1200 starters. It cost about $20 for the brushes. One tip if you read the Clymer manual, the first step they list is "remove the engine". You can tear that page out if you like. 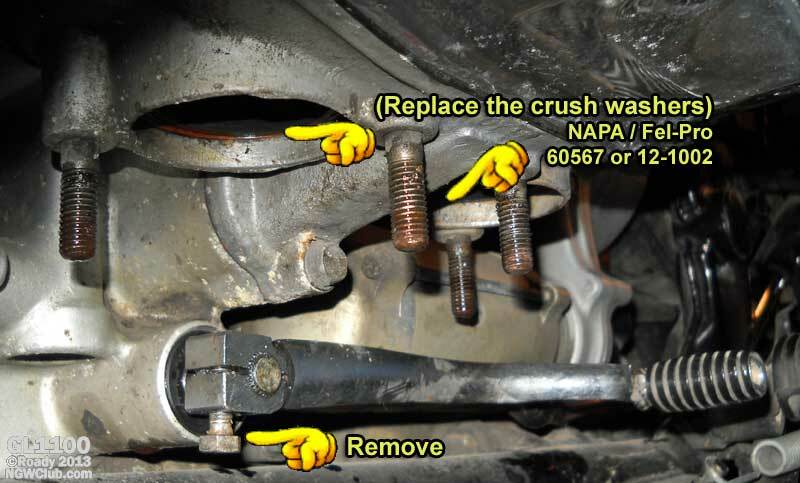 Soak your header bolts, both sides, with PB blaster. Wait an hour or a day and soak them again. Remove the negative lead to the battery. 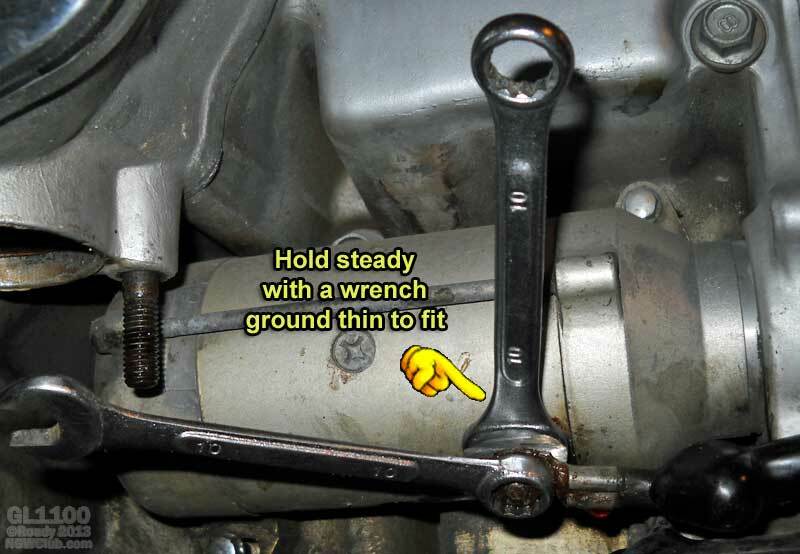 Then carefully remove the header bolts (both sides) and loosen the muffler mount bolts. The headers will then drop down so you can get at it. Remove the shift lever (now would be a good time to replace the shift lever seal if yours is leaking). Remove the 10mm nut that holds the power cable on. Remove the two 8mm bolts that hold the starter. The little chrome heat shield will probably fall off but if it doesn't remove it. Slide the starter toward the front of the engine, you may have to pry gently to get it moving. Remove the starter. Get a marker of some sort and mark both "caps" and the body so you re-assemble in the exact same position. Put the starter on the bench and soak the long screws, top and bottom of the screws, with PB blaster. If they don't want to break free immediately, us a pair of vise grips on the screw shaft just above the threads to get them broken free. I use a rag covering my vise jaws to support the starter in the vertical position with the gear facing down. Remove the rear "cap" and you'll see the brushes and probably a lot of carbon dust. There are two washer in there on the commutator shaft so don't lose them. Remove the one little screw (it looks smaller but a #2 Phillips is correct) that holds the brush with the insulation and assembly to a wire coming out of the starter body. Now lift the brush holder, brushes and all off. Now is the part that sounds tedious but really isn't. Us a small scratch awl or a small screwdriver to clean all of the little gaps between the copper contacts on the commutator. You are not trying to make new grooves just clean them out. When finished spray some carb cleaner on the commutator contacts to clean them and blow dry. Remove the brushes from the mounting plate. Pay attention to which goes where. One of the brushes has an insulated wire the other doesn't. The one without insulation is the one that bolts to the mounting plate. Put in the new brushes and re-assemble in the reverse order. Put a drop or two of light machine oil on the commutator shaft where it rides in the bushing on the "cap". Bench test it and put it back it. The splined end of the starter mates with the drive sprocket but it is very easy to rotate the starter enough to get them to mate. good luck and there is no magic to replacing brushes in any automotive type starter. Now if the starter is actually burned up I suggest you get a new one. 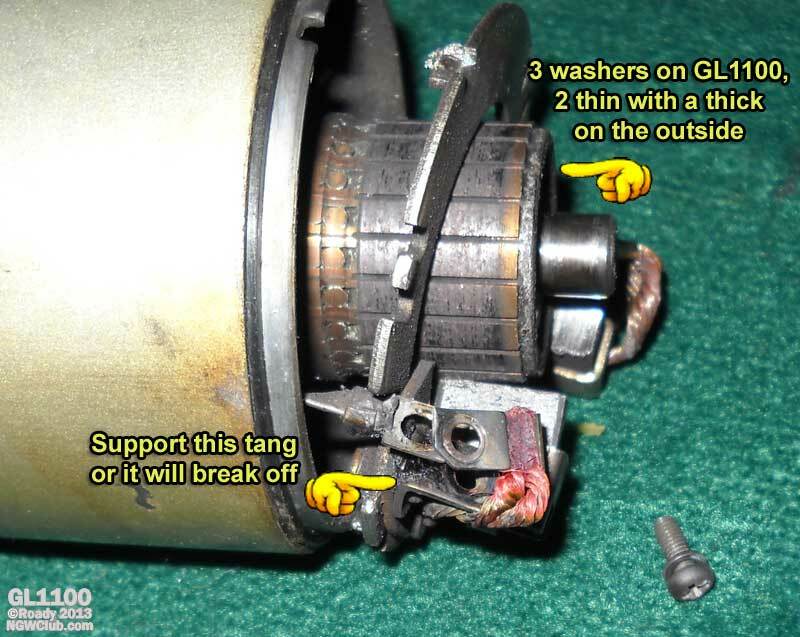 We don't cover rewinding a starter in this forum. Part 28; Goldwing Starter Motor Refresh. By Tim Wentzell, Mr. Magic Fingers on the goldwingfacts.com forum. Last edited by jdvorchak on Thu Dec 16, 2010 12:50 am, edited 1 time in total. John, I'm getting ready to do mine. Just have to see if the brushes are available and get them in. Great writeup, I must have been on vacation when you did this because I hadn't seen it. I searched on starter and your username and this popped up. Let's get this into ShopTalk. When I do Mine I'll add some pics for the 1100 folks. I just sent you an email. Glad to help if you like and anyone else in the St. Louis Area that want's to come by is more than welcome. Remove the brushes from the mounting plate. Pay attention to which goes where. One of the brushes has an insulated wire the other doesn't. The one without insulation is the one that bolts to the mounting plate. Whoop! Mine don't match this description...neither ot the old brushes seems to have an insulated wire. I'm sure the new one will, but can you give me anymore detail on how to tell where that new insulated one goes? Obviously, someone was in this starter before me...there are scribe marks on the casing already. Anyone have a diagram or pix of how it should look inside? The insulated wire will hook to the wire from the Battery/solenoid. The bare wire will hook to the mounting plate. Think about what would happen if the wire from the battery were to touch the case of the starter or the mounting plate. Instant short circuit. Just common sense tells us to keep the hot wires from contacting chassis ground. 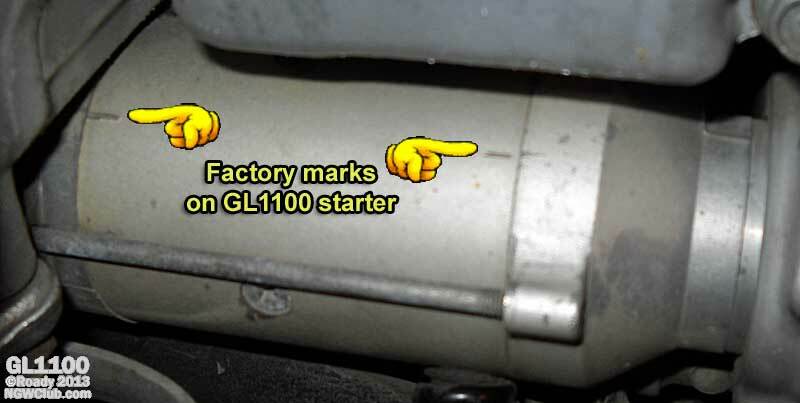 First of all thanks for the link to the starter refresh guide over at goldwingfacts.com. Secondly, I am here because I had a chance to take apart and "refresh" a spare starter that was given to me by the P.O. Right now I don't have any photos of what I'll be describing but I may edit this entry to fit them in. Most of the "refresh" article is good but there are some items that should be looked for that weren't mentioned. I went through it and found some things were wrong on my starter. When I looked at the brush-plate I noticed there was discoloration and then by further investigation I noticed there was scorching or looked like tac-welding on the frame. The brush block wasn't seating flat up against the starter frame. To remedy this I bent 2 tabs one way and the other opposite. And then filed the pitting where the tabs were arcing (tac-welding). I then carefully made sure when I put it all back together that the positive brush cable didn't come in contact with the frame as well. Another thing I discovered is the plastic outer gear, which the two smaller gears ride on, was not a perfect circle ...it was because the slippage pin wasn't lined up with the groove on the plastic gear. I carefully removed this by using a 0.040" piece of scrap metal and cut it to exactly the diameter to grab onto the teeth without damaging as well. I was being as careful as possible. Once I had it worked out. I cleaned the grease from around the gear then used a gasket sealant to hopefully prevent this gear from ever slipping again. Extra Gee-Whiz ...I have access to a starter/alternator tester and spun up the starter before I did all this work ....the ammeter measured 100 A to crank the motor over. Tomorrow I will put it on the tester to see if it draws less amps ....I sure hope it does. I used a crocus cloth instead of the steel wool which the "refresh" guide tells everyone to use. I personally would rather use some brass wool, or even crumpled aluminum foil over steel wool ...I think it's too tough on the copper commutators. I also used a sharp point of a popsicle stick to get all the gunk out of the segments between the commutators. Best of luck with everyone's refurbishing ...now my spare looks better than what's on my ride. ~Looks to be a slow work in progress, a little bit at time is alright. I've been refurbishing the starter for my '76 GL K1 and thought I'd strip the spare I had which is off my 79 KZ donor bike because I thought I could swap parts around depending what was good. To get the 77 one off the bike I had to drop the exhaust and remove the left rear exhaust stud (to get the starter out while the engine was in the frame). On the KZ I didn't need to remove the stud ( the exhaust was already off). When I had the starters apart on the bench it became obvious that the 2 were different lengths. Internally the layout is the same but the central body (the bit between the 2 end caps) and the armature are about 5mm longer. This is why i couldn't easily get the starter out of the 77 bike as when you disengage it there isn't enough forward movement to let the drive cog clear the mouth of the mounting point hole. Honda must have figured out that it is difficult to remove the starter on earlier bikes without remove exhaust and stud - and hence why the later starter is 5mm shorter - now there is enough room to remove it! 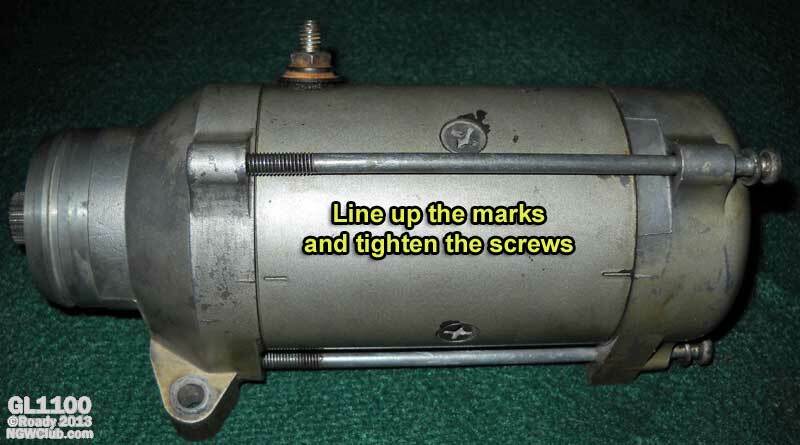 I guess the point of this post is if you are rebuilding an early GL1000 bike it is worth trying to source a later starter because if you ever have to service it you can remove it from the bike without having to drop the exhaust / remove the rear stud. 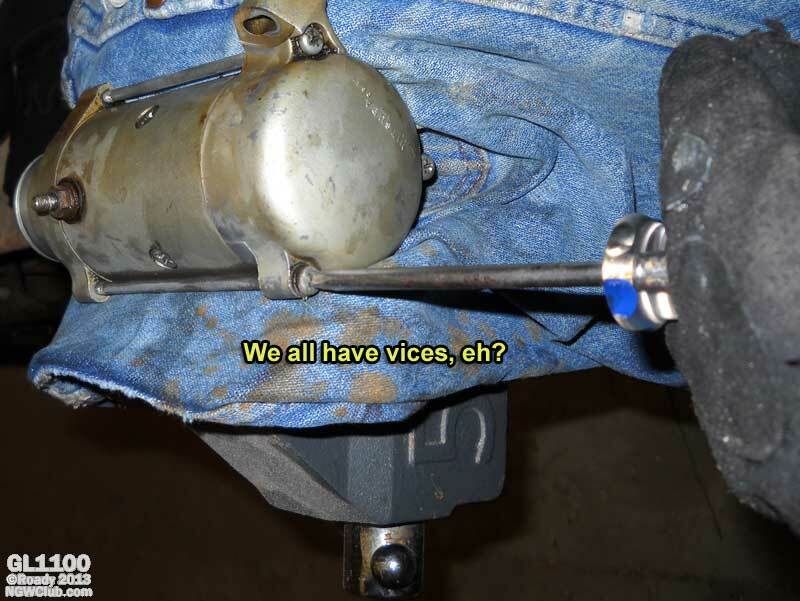 Well, three and a half years later I got around to servicing my starter and adding pics to John's how-to. The starter has never failed to work but sometimes it took two or three tries for it to catch. Yesterday I pulled it out and cleaned it up. The brushes looked healthy so I left them in and just cleaned it up and routed the brush wires more carefully than they were before. It appears to be the original starter though there was no insulated wire on one of the brushes. Not quite sure what that's on about. There was some carbon in the cap and what looked like soft metal shavings. The refurb appears to have done the job because it now seems to be working perfectly. Thanks again for the writeup. @jdvorchak; I hope you like the pics I added to your original post. *** When re-installing the starter, and you've lined up the spline shaft with the cog...you may need a prybar to assist in sliding the starter back into place. It's a tight fit, similar in feel to a "press fit" like a new bearing race. Knowing about this beforehand would have saved me a lot of aggravation and a couple days of worry! That being said, refurbishing a starter like this is not a terribly difficult job! Have confidence in your abilities!